Weekend Historical Happenings: 8/11/12 - 8/12/12 ~ The History Girl! The Historical Society of Ocean Grove is holding its Annual History Day Lecture in Bishop Janes Tabernacle on Pilgrim Pathway beginning at 10:30 AM on Saturday August 11th. This year's topic details the construction and changes that have occurred at the Great Auditorium from 1894 to present day. The presentation by authors Darrell Dufresne, Ted Bell, and Cindy Bell on their new book about the Auditorium will emphasize the uniqueness of the Auditorium and some of the mysteries. A tour of the auditorium will follow at 11:30 am with a book signing by the three authors. For further information contact the museum at 732-774-1869 or e-mail info@oceangrovehistory.org. On Saturday at 2:00 pm, learn about your family's history at the Van Veghten House in Bridgewater. This program will give you general information on how to get started researching your family's genealogy. You will learn about where to look, what to look for, and how to go about your research. A special emphasis will be given to records in Central New Jersey. Elizabeth King Pellicane is a professional genealogist with over 17 years experience. Her focus is New Jersey, in particular, Essex, Hunterdon, Morris, Somerset, and Warren counties. She is a volunteer at the Hunterdon County Historical Society and a member of the Association of Professional Genealogists, Central Jersey Genealogical Club, Genealogical Society of New Jersey, the Hunterdon County Historical Society, the National Genealogical Society, and the New England Historic Genealogical Society. Admission for non-members: $5; Admission for SCHS members: free. The Derrick Van Veghten House, 9 Van Veghten Drive, Bridgewater, NJ 08807. Come to the beautiful grounds of the Physick Estate at 1048 Washington Street in Cape May for this all-day (11:00 am - 8:00 pm) festival featuring local craft beers to wash down favorite summer picnic foods such as a crab boil, pulled pork, corn on the cob, potato salad and more. All-day music on the outdoor stage includes Dave Landry, the Kruno Spisic Band, the Kelly Carvin Band, JL3 and The Jazz Band. Have fun at the old-fashioned Victorian carnival arcade, with jugglers and acrobats along with games of chance, face painting, crafts vendors, a farmers' market and more. Admission to the grounds is free. There will be a charge for food, beverages and some activities. Bring home a commemorative pint glass or T-shirt. Visit the Craft Beer Tent and purchase and enjoy beers from these great breweries courtesy of Harrison Beverage: Cape May Brewing Company, Tuckahoe Brewing Company and Victory Brewing Company. Sponsored by PNC Bank and presented by the Mid-Atlantic Center for the Arts & Humanities (MAC). For more information, call 609-884-5404 or 800-275-4278 or visit www.capemaymac.org. Proceeds benefit MAC's educational outreach programs. The 61st New York Volunteer Regiment will visit the grounds of the Havens Homestead Museum in Brick for an overnight encampment. The public is invited to visit and share experiences with them. For more information, please visit www.bricktwphistoricalsociety.com. The Havens Homestead Museum is located at 515 Herbertsville Road, Brick. Call 732-785-2500 for more information. Join the Red Mill in Clinton for their annual living history American Revolution Weekend featuring Patriot and Loyalist forces, drills, demonstrations, music, displays, presentations, and more! Hours both Saturday and Sunday are 10:00 am - 4:00 pm. Sal DeSapio, a true wealth of historical information, will be speaking on the life and military service of an integral Patriot and crusader in the American Revolution, General Daniel Morgan, at 11:30 am on Saturday. On Sunday at 2:00 pm, Todd Braisted will discuss what it meant to serve King George III during the American Revolution. For the full list of speakers and a schedule of events, click here. Admission: $9/adults, $7/seniors, active military, and veterans, $5/children (6-12), FREE for members and children under 6. 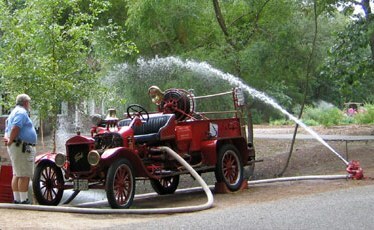 Red Mill Museum Village, 56 Main Street, Clinton, NJ 08809. For more information, visit www.theredmill.org. For the past 27 years, antiques dealers from across the Mid-Atlantic region have gathered along Historic Cold Spring Village's shaded, clamshell lanes to display and sell their wares. The event takes place August 11th - 12th with hours from 9 am to 4:30 pm on Saturday and 10am to 4:30pm on Sunday. The village's restored historic buildings, which date from 1691 to 1912, will be open with historical interpretations and demonstrations of the trades and crafts from the mid-1800s. At 2:00 pm on Saturday, enjoy the Bob Ferris Orchestra providing big-band entertainment for all ages. Please join us for a fun, family-friendly summer's afternoon performance by singer-songwriter & guitarist Gary Reed who will perform in the beautiful historic garden of Macculloch Hall Historical Museum on Sunday at 4:00 pm. Mr. Reed has reemerged as an accomplished and contemporary voice - with lyrics that resonate from that earlier time. An outstanding guitar player and performer, he is a premier fingerstyle guitar player and guitar champion winner who writes and plays unique solo guitar arrangements ranging from Joplin to the Beatles, New Age to Yazoo and "Finger Popping" original tunes. His style comes out of the 1960's revival of the black blues guitar players and performed with guitar guys from New York City and San Francisco. Gary started his performing career in the Village in the late sixties and early seventies being a regular player at the Bitter End, Folk City, Café Wah, Max's Kansas City, The Village Gate and most of the clubs in the Village at that time. He had the opportunity to open for some great players such as: Jerry Jeff Walker, Billy Joel, Randy Newman, Joe Walsh and Jeremy Steig. Gary will perform in the Garden at 4:00 pm. Visitors will have the opportunity to explore through a variety of summer blooms in the garden and relax on the large lawn during the program. Guests may bring picnics, blankets or chairs and settle back for a late afternoon of great music in a beautiful setting. Travelling Treats Ice Cream Company will have a variety of treats on sale throughout the performance. 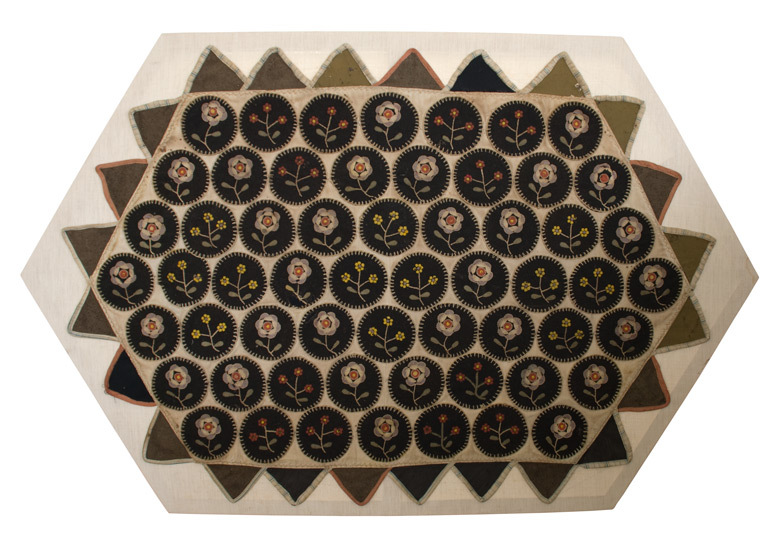 Watch and learn about making penny rugs at a demonstration at Longstreet Farm on Sunday between 1:00 and 3:00 pm. Longstreet Farm is located at 44 Longstreet Road, Holmdel, New Jersey 07733. Click here for more information. Visit the Princeton Battlefield this Sunday, for their annual "Day of Leisure" at the Thomas Clarke House. Period dressed volunteers welcome participants of all ages to try out various 18th century games. You can play trap ball, a game of graces or try your hand at a number of dice games like Farkle or Teetotum. The event will be held rain or shine from 11:00 am to 3:00 pm. 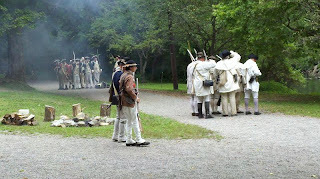 Hi - I've pictures from the Revolutionary War Days event at the Clinton Mill in Hunterdon County yesterday. I hope you like them!